What types of neighbourhoods are redlined? 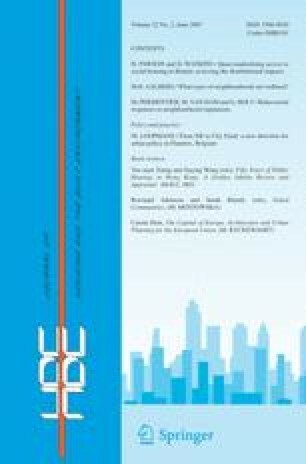 This paper presents a case study of lending behaviour in the city of Rotterdam, the Netherlands. It shows what types of neighbourhoods are redlined by analyzing redlining data of the two largest suppliers of mortgage loans and comparing it to social-demographic and housing market data at the neighbourhood level. Although this approach cannot explain redlining, it can show which factors are related to lending behaviour. Low income, unemployment and ethnicity are strongly positively correlated to redlining. A discriminant analysis shows that the interaction between low income, unemployment or ethnicity on the one hand, and the average value of sold units on the other hand can best approximate redlining. Lastly, this paper also highlights the importance of scale. I would like to thank Rogier van der Groep for his suggestions and assistance with SPSS, Els Veldhuizen for making the maps, and the anonymous referees and the editors, as well as Sako Musterd and Robert Kloosterman, for their helpful suggestions.